This edging has taken me ages because I have been caught up with work and studying, but I am showing it, plus my latest shuttle, because TattingChic asked me to. Yes, I too was wooed by the beauty of this delightful shuttle from Shuttle Shop. It is wound with Tatskool's Rainbow Bright HDT in size 80 and I plan to continue with another pattern from a previously unused book. 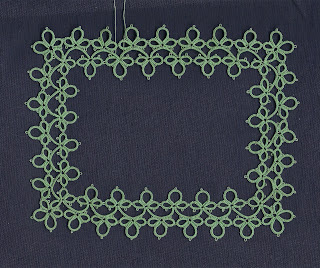 The edging is from "Tatted Handkerchiefs" by Kirstine and Inge Lise Nikolajsen and I cheated by making it just big enough to decorate a photo frame or a greetings card. A whole handkerchief would have taken me too long....lol! Sharon has asked me what makes me inspired about a pattern and what turns me off. 1, I like it to look "lacy"
2, I like symmetry and repeats. 3, I am not so keen on figurative stuff, not for me butterflies or animals. 4, I like a challenge...yes Hen and Chicks is pretty, but I do want something that makes me have to think, a bit anyway! Size 80...(whimper). I am so not worthy. What a beautiful shuttle you have! I am glad to see you tatting again and I hope you enjoy it.